Beginning this Fall, Canuck Place will be spreading it’s message across the province in a new way – on a 53-foot Stryder truck. 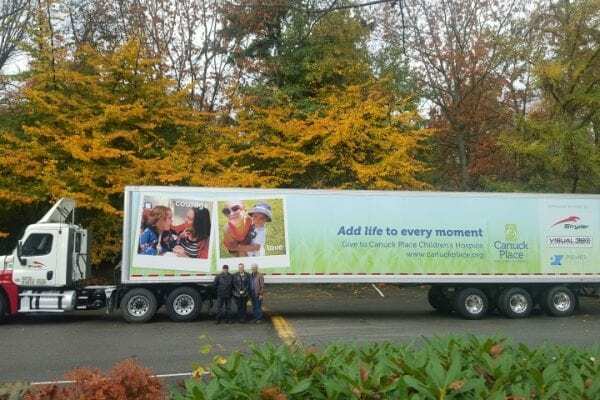 A partnership between Stryder Motorfrieght, Visual 360, and Premier Graphics has placed Canuck Place photos and messages on a truck that will travel as far south as Portland, and as far east as Edmonton and Calgary. Dave Mori of Visual 360 put the opportunity together. Canuck Place was an obvious choice for him. The connection to Canuck Place is a personal one for Dave. He and his wife, Sharon, lost a child to cancer prior to the opening of Canuck Place. Their time at BC Children’s Hospital put them in touch with Canuck Place founder, Brenda Eng. When Canuck Place opened in 1995, the Moris were some of the first volunteers, doing everything from working with families, to helping out in the kitchen. Their dedication to Canuck Place has lasted for over 20 years, and is now displayed larger–than-life on highways across the Province. If you spot the Canuck Place truck on the road or at a rest stop, take a picture (as long as you’re not driving!) and tweet or instragram it to us @CanuckPlace! Thank you to Stryder Motorfrieght, Visual 360, and Premier Graphics for donating your services to spread the Canuck Place message.